Sheam-Chyun Lin Department of Mechanical Engineering, National Taiwan University of Science and Technology, Taiwan, R.O.C. Yu-Ming Lin Department of Mechanical Engineering, National Taiwan University of Science and Technology, Taiwan, R.O.C. Yu-Song Haung Department of Mechanical Engineering, National Taiwan University of Science and Technology, Taiwan, R.O.C. Cheng-Liang Yao Metal Industries Research & Development Centre, Taiwan, R.O.C. Bo-Syuan Jian Metal Industries Research & Development Centre, Taiwan, R.O.C. Pneumatic solenoid valve has been widely used in the vehicle control systems for meeting the rapid-reaction demand triggered by the dynamic conditions encountered during the driving course of vehicle. For ensuring the safety of human being, the reliable and effective solenoid valve is in great demand to shorten the reaction time and thus becomes the topic of this research. This numerical study chooses a commercial 3/2-way solenoid valve as the reference valve for analysing its performance. At first, CFD software Fluent is adopted to simulate the flow field associated with the valve configuration. Then, the comprehensive flow visualization is implemented to identify the locations of adverse flow patterns. Accordingly, it is found that a high-pressure region exists in the zone between the nozzle exit and the top of iron core. Thereafter, the nozzle diameter and the distance between nozzle and spool are identified as the important design parameters for improving the pressure response characteristics of valve. In conclusion, this work establishes a rigorous and systematic CFD scheme to evaluate the performance of pneumatic solenoid valve. R. B. Varseveld and G.M. Bone, “Accurate position control of a pneumatic actuator using on/off solenoid valves,” IEEE/ASME Transactions on Mechatronics, vol. 2, no. 3, pp. 195-204, September 1997. N. Gentile, N. I. Giannoccaro, and G. Reina, “Experimental tests on position control of a pneumatic actuator using on/off solenoid valves,” Industrial Technology, IEEE ICIT ’02, vol. 1,no. 3, pp. 555-559, December 2002. G. Belforte, S. Mauro, and G. Mattiazzo, “A method for increasing the dynamic performance of pneumatic servo systems with digital valves,” Mechatronics, vol. 14, no. 10, pp. 1105-1120, December 2004. T. A. Parlikar, W. S. Chang, Y. H. Qiu, M. D. Seeman, and D. J. Perreault, “Design and experimental implementation of an electromagnetic engine valve drive,” IEEE/ASME Transactions on Mechatronics, vol. 10, no. 5, pp. 482-494, October 2005. E. E. Topçu, İ. Yüksel, and Z. Kamış, “Development of electro-pneumatic fast switching valve and investigation of its characteristics,” Mechatronics, vol. 16, no. 6, pp. 365-378, July 2006. G. Tao, H. Y. Chen, Y. Y. J, and Z. B. He, “Optimal design of the magnetic field of a high-speed response solenoid valve,” Journal of Materials Processing Technology, vol. 129, no. 1-3, pp. 555-558, October 2002. L. Wang, G. X. Li, C. L. Xu, X. Xi, X. J. Wu, and S. P. Sun, “Effect of characteristic parameters on the magnetic properties of solenoid valve for high-pressure common rail diesel engine,” Energy Conversion and Management, vol. 127, pp. 656-666, November 2016. Z. F. Peng, C. G. Sun, R. B. Yuan, and P. Zhang, “The CFD analysis of main valve flow field and structural optimization for double-nozzle flapper servo valve,” Procedia Engineering, vol. 31, pp. 115-121, 2012. Y. X. Ma and D. C. Sun, “The numerical simulation of the flow field in an electromagnetic valve,” Machine Tool & Hydraulics, vol. 36, no. 1, pp. 111-113, January 2008. Ansys Fluent User’s Guide-14.5, ANSYS Inc, 2012. B. E. Launder and D. B. Spalding, “Lectures in mathematical models of turbulence,” Academic Press, London, England, 1972. J. O. Hinze, Turbulence, McGraw-Hill Publishing Co, 1975. S. V. Patankar and D. B. Spalding, “A calculation procedure for heat mass and momentum transfer in three-dimensional parabolic flows,” International Journal of Heat Mass Transfer, vol. 15, no. 10, pp. 1787-1806, October 1972. 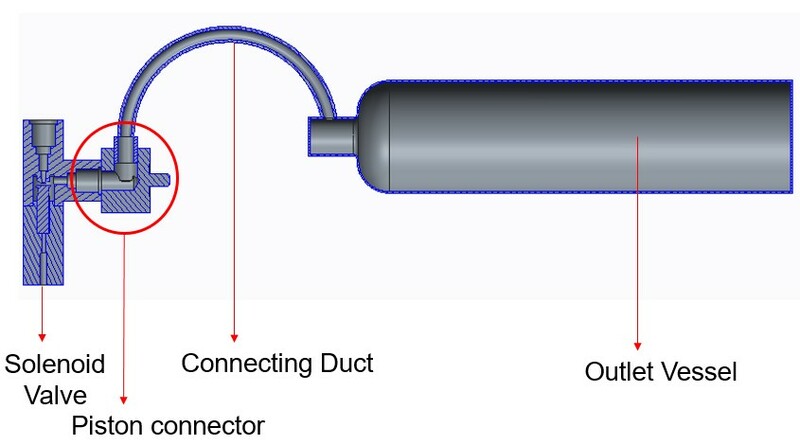 S.-C. Lin, Y.-M. Lin, Y.-S. Haung, C.-L. Yao, and B.-S. Jian, “Flowfield Analysis of a Pneumatic Solenoid Valve”, AITI, vol. 3, no. 3, pp. 133-140, Mar. 2018.